Hidely-ho Halloweeno's! Hallowinos? Maybe I'll stick with the first one. Anyhow, it's HALLOWEEN! The best day of the year! 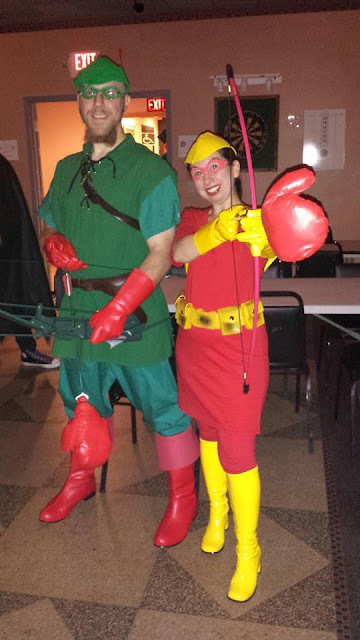 A couple of weekend's ago was Comicazi's (our local comic shop) Halloweeniversary, the party that TinyDoom and I plan all year for. This past year we decided to go with a DC theme, since last year we went Marvel. I was hoping to find a few more of my favorite pumpkin beers to review, but alas, the season is passing and they are no longer available. I searched high and low for one more bottle of Southern Tier Pumking (which would be my favorite), but it's all gone. Oh well there's always next year. So, I guess I have given my thoughts on the individual beers that I had a chance to taste and blog about already, so I'll just get to numbering them. All good beers, some gooder than others. If you are new to pumpkin beers I recommend starting at the bottom of my list and slowly working your way up. Let me know what you've tried and what beers you've had that I didn't review, I'm always looking for new pumpkin beers to try. If there's any interesting non-pumpkin beers you've had lately that you think I should try, let me know! See you next time bloggouls! I don't know if anyone is enjoying these posts as much as I am enjoying "researching" them, but either way, on to the next brew! I have a beer from what has become one of my most favorite breweries, Southern Tier. I have sung the praises of their Pumking, though not reviewed it yet (I haven't been able to find it lately and worry that the season has passed), but luckily they have another pumpkin beer, this time it's a stout! This is the first time I've had this and Wow, it's absolutely delicious! It's an Imperial Stout, 8.6% alcohol and cost $8.95. The bottle says it uses 4 different malts and 2 kinds of hops. It's got a strong caramel profile and a nice roasty-ness overall. It's not strongly pumpkiny, the caramel overpowers it a bit, but it all balances out nicely. It's pretty sweet and a heavy drink, which is exactly what I love about these types of beers. This is a great cool October night drink. I may need to stock up a bit to be sure to have one available for Halloween night. Warlock has jumped into my top pumpkin beers, I'm looking forward to doing a final summary and see just where it falls. 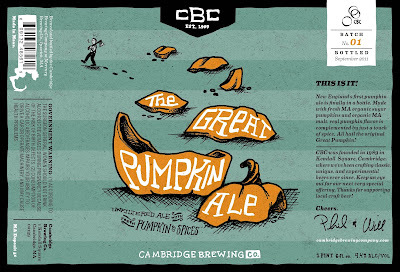 Brew Battle: Great Pumpkin Ale! Today, for you, I have a local brewery's pumpkin offering. I have two pictures this time around because I had the beer (again, I make these sacrifices for you, my friends) on tap recently at Za. That's a great looking label. 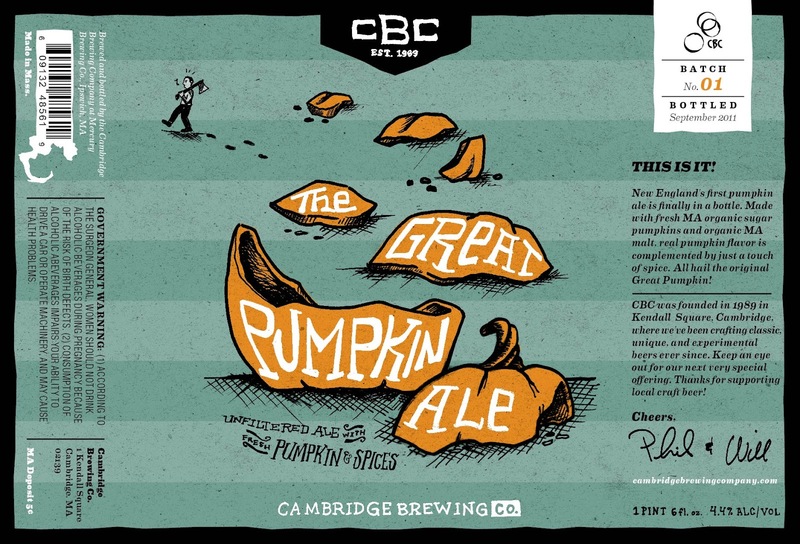 Cambridge Brewing is located in Kendall Square, Cambridge, MA, it's a bit of a pain to get to if you are local, but worth the effort. They have a brew pub with good food and great beer. I went there as part of my bachelor party, we had a few beer towers to kick the afternoon off right. But I digress, The Great Pumpkin is a good pumpkin ale, but again, maybe not in my top 10 overall. It's a tasty, but a bit light. I guess if you don't like a taste whallop, like I tend to, then it might be right up your alley. This pint ran me about $6, so pretty standard for a draft pint and it's 4.4%. It has a mild hoppy and citrus start and a smooth yammy body. The pumpkin taste lingers at the end, but overall it's a bit on the light side. I think I'd like this beer more if it was a bit deeper, but to each his own, not all pumpkin beers need be heavy brews. This is one of the better light pumpkin ales. Let me know what kind of beers you guys like, I'd like to get a feel for what other folks prefer. Before we get to the party, I'd like to take this opportunity to point out the new header for the blog, I decided to update it this morning. I think it's less clumsy looking than the previous one. Okay, enough patting myself on the back, here we go! Brew Battle returns, again, yes, I bought a lot of pumpkin beer, no I don't have a problem...unless you count not enough time to drink all the available pumpkin beers a problem, and I do. LET'S GET TO IT! Saranac, from NY, is one of my go-to's. I have yet to find a bad beer out of this brewery. I have had this before, but I had not seen this jug style bottle before stumbling across it in my local shop. It's a quart of brew and only runs $4.99! What a deal (he said in a Zoidberg voice)! This beer clocks in at 5.4%, so slightly above average. It's got a lovely red color, a bit of a caramel sweetness up front and a bit of a cinnamon pumpkin finish. It's sweet, but not cloyingly so, I would say it's very easy to drink. It could be more pumpkiny but it's a very nice cool weather beverage. It also comes in a pretty cool bottle, which is temping to keep and use as a seasonal decoration. I had previously had this in the Fall 12 pack mix, so it's nice to see it available on it's own. I'm drinking a pumpkin beer, so that can mean only one thing: IT'S BREW BATTLE TIME! This is a popular beer, I know a lot of people that are very passionate about Pumpkinhead. Personally, I enjoy Pumpkinhead but it's not one of my top favorites, not to say I don't like it, because I end up drinking it often enough. Although drinking it often is usually because it tends to be one of the few "craft" beers on tap (unless you find yourself in a very good bar). Bars often offer it with a cinnamon/sugar rim for your glass, while I have been known to partake of the sugar rim, I question whether a properly made beer needs any bells and whistles. But a bit on that later. Pumpkinhead is pretty light, it's a light color, light alcohol percentage at 4.5% and relatively inexpensive, I think I paid maybe $8 for a six pack. It's sweet and a bit tart, it's pleasantly crisp and finishes with cinnamon and pumpkin, lightly. This is a good beginner's beer for those dipping their toes outside of the Bud pool and into the neighbor's deep and mysterious pool. So, getting back to the cinnamon/sugar rim, if it's offered, go for it. I think it definitely enhances the pumpkin pie in a glass thing. But. I kind of wish it wasn't necessary, the beer could be a bit more complex in it's profile, but to that effect, if I want a more complex beer then perhaps I should be drinking one. Well, I guess I'm done arguing with myself. In conclusion, it's a good easy to drink beer for a cool fall day. Despite it's short comings, I wouldn't kick it out of my bed...but I'd be thinking of another seasonal beer while we snuggle. Brew Battle returns with my seasonal theme of pumpkin beers. Today I'm reviewing Samuel Adams' Fat Jack Double Pumpkin. Fat Jack is one of Sam's pint bottle special small batch brews. I bought it for $6.95 and it's 8.5% alcohol. This beer is apparently brewed with 28lbs of pumpkins per barrel, according to the bottle, so it's very flavorful. The label also says that it has cinnamon, ginger, nutmeg and allspice. The first taste is sweet and malty, then you get the pumpkin and the spices, it finishes very smooth and easy for a beer that is as sweet as it is. It doesn't leave a sticky sweetness on your tongue like some sweet drinks. It's a very hearty brew and one that I have started to look forward to, I believe last year was the first time it was available and when I saw it in the store I did not hesitate to grab it again. If you don't mind sweet, this is a bit like drinking a malty pumpkin pie. Me? I love malty and pumpkin pie, so it's a "Hell Yes" for me. Welcome back once again, to Brew Battle. The battle for my taste buds...and to keep off my beer belly (and yes, my appreciation for alliteration). This time around I'm going to be talking about one of my favorite seasonal brews. There have been so many amazing pumpkin ales produced over the recent past that there is no shortage of breweries offering their own unique take, there's always something new to try. As you may have guessed, pumpkin ales are one of my absolute favorite beers. Actually fall is my favorite time of the year, with winter a close second, partly because they bring some of my absolute favorite beer styles to the stores. Post Road is the first pumpkin beer I ever had and it was love at first swig. It's crisp and perfect for a nice cool day, a good beer to relax with after a morning spent picking apples. The first sip has a bit of hops, then the sweetness (but not too sweet) from the pumpkin and a bit of cinnamon. It finishes with a faint vegetableness from the pumpkin. It's very pleasant and easy to drink and it remains one of the pumpkin ales I look forward to every year. I think there are superior pumpkin ales available, (Southern Tier Pumking, I'm looking at you, my precious) but I always come back to Post Road. I was just saying last week that I had not seen it in stores and was disappointed (that was remedied, obviously), I think it's a bit of a tradition for me and sort of officially signals fall. I hope you, my dear readers, also enjoy pumpkin beers, because the next batch of Brew Battle posts are all going to be pumpkin related. In the mean time, please share your favorite seasonal beers in the comments! Howdy fellow bloggees! I'm starting a new series of posts about one of my favorite things, beer! Hopefully this will help me get back into the habit of posting, since I'm always trying new beers, I should often have something to talk about. Hopefully I'll be able to describe the beers adequately, only one way to know for sure...let's get to it! Today my wife, TinyDoom, and I walked into our local market, Pemberton Farms, to find that it had recently transformed into a Beer Wonderland! They had a decent selection before, but they expanded and the selection is now pretty impressive. I discovered a bunch of new beers that got me quite excited and inspired this post today. At least I'm telling myself that the blog was a good enough excuse to buy more beer. I walked out with 3 bottles and today I have the first to share. I found this in a pint sized bottle, it's 7% alcohol and cost $8.99. The bottle describes the stout as having "chocolate and caramel sweetness, balanced by hop bitterness, roasty, woodsy notes and an earthy finish". I think that sums it up pretty well, I definitely got the chocolate up front and the finish is certainly woodsy. If I had a fire place I'd want to drink this in front of it, with a nice bowl of some kind of hearty stew close by and some crusty bread. I had heard Ommegang's other GoT beer was okay, a fairly standard ale, so I was a bit dubious about this one, but being a sucker for dark beers I figured it was worth a try and I'm glad I did. Now hopefully I can find it again later in the year when it's much cooler out, because as you may have heard, "Winter Is Coming."